Preheat the oven to 200°C, gas mark 6. Make the tomato sauce. Cook the spaghetti in boiling salted water for only 7 minutes, then drain. Put in a bowl and season, add 3 tablespoons of olive oil, and toss. Peel and finely chop the garlic. Deseed and finely chop the chilli. Heat 1 tablespoon of olive oil in a thick-bottomed pan, add the garlic and when coloured, add the prawns, chilli and season. Cook to heat through. To make the bags, cut foil into 4 x 50cm lengths and drizzle with olive oil. 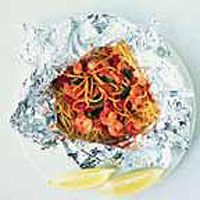 Divide the spaghetti into four, and place in the centre of each piece of foil. Spoon over 1 tablespoon of hot tomato sauce, a quarter of the prawns and a few basil leaves. Bring the edges of the foil together and fold to seal, leaving the top open. Pour 2 tablespoons of wine into each foil bag, then seal the top. Place the bags on a tray in the oven and bake for 6-8 minutes until they inflate. Serve in the bags with lemon.